This book combines the discipline of daily Bible reading & prayer appropriate to the season with the opportunity to think about some of the issues that are crucial in the modern world. Issues such as HIV/AIDS, justice, peace & conflict are covered. - Publisher This Lent book combines the discipline of daily Bible reading and prayer with the opportunity to think about some of the issues that are of crucial importance in the modern world, such as HIV/AIDS, justice, peace, and conflict. There is a daily program of Bible reading, reflection, and prayer for every day of Lent, from Ash Wednesday to Easter Day. 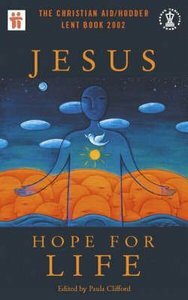 About "Jesus, Hope For Life"
This Lent book combines the discipline of daily Bible reading and prayer with the opportunity to think about some of the issues that are of crucial importance in the modern world, such as HIV/AIDS, justice, peace, and conflict. There is a daily program of Bible reading, reflection, and prayer for every day of Lent, from Ash Wednesday to Easter Day.